Yesterday my 18-year-old son and I attended the Banksy Exhibition in Melbourne which is curated by Steve Lazarides, known to be Banksy’s original spokesman in the art scene back in the UK before anyone really knew who Banksy was. We still don’t know who Banksy is, bar a few very close and trusted companions and I like this. Of course, it’s about intrigue but it’s also about a person who has decided, for whatever reason, to put the work before his identity. A bold move in this day and age of self-promotion and gratification. Art moves me. It doesn’t matter what era, country, culture or educational status it has come from or even the form or medium used for its construction. I have stood in front of Da Vinci’s Mona Lisa, Delacroix’s Liberty Leading the People, Pollack’s Blue Poles, Degas’ sculpture Little Dancer of Fourteen Years and my beloved Van Gogh’s self-portrait. I have been emotionally connected to each one of these as much as I was to Banksy’s work today. Some debate that his works are not art and therefore do not deserve the same degree of consideration as the aforementioned. I disagree. His work moves me. It challenges me. It awakens my mind and heart to see things past what I see with my eyes. It becomes all about the way it makes my heart and mind resonate instead of the things I am told I should appreciate (no offence to the experts, of course!). The street art or graffiti of Banksy and those who have gone before and after him is known for providing deep and confronting commentaries on modern society. It’s intentionally controversial, anti-establishment and rebellious. I anticipated that I would see works today that would confront me but what I didn’t anticipate was the deep sense of resonance I felt when viewing certain works. I liked his work purely from a place of curiosity and respect for originality. I didn’t realise how much of it I would find myself agreeing with. I won’t spoil it for you but there were many images that gave me pause. This one spoke deeply to my heart and to my character and I was glad to be able to buy a print. It will hang in my office – aka creative space – to remind me of what really matters to me, and in my opinion, to the future wellbeing of the world and society as we know it. 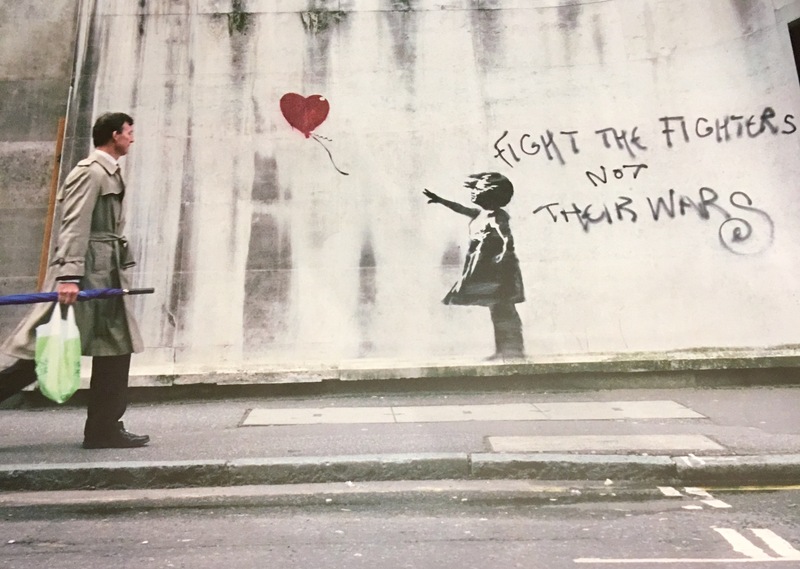 But one of the things I like about Banksy (other than the fact that he’s the same age as me, making being in our 40’s a great year for creatives and thinkers alike!) is that he says that he has no intention of telling me what I should or should not feel about his work. This gave me the freedom to let myself, as a mother, feel deeply the messages I felt he was sending me. Watch out for those who want to take advantage of those who have no advantage. 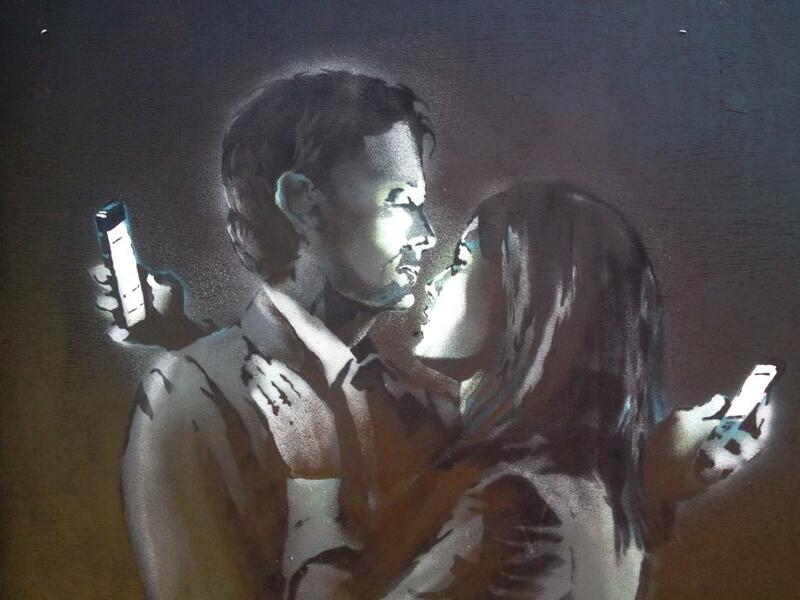 Be wise who and what I give my attention to, as expressed in this piece created in Bristol called Mobile Lovers. Mobile Lovers, Banksy, courtesy of Life Hack. I may be a 42-year-old grandmother (yes it’s totally true!) and not be in any way an expert on this kind of art but I moved by it nonetheless. I think that going to exhibitions, experiencing new ideas, especially ones that make us question our lives and purpose, are vital to helping us move forward as humans. This is how we refine what we believe and redefine who we are. So the next time you hear about something like this in your area, I encourage you to attend. Or to read the book that has lots of things you’ll disagree with or one that makes you look up words that you don’t understand! Or talk to the person who you have a completely opposite life to. Whatever it is, be exposed to the things that scare you for it is when we do this, that we find the true parts of ourselves and become the people we are ultimately designed and created to be. And this might just start a war on mediocrity, celebrity-parroting and staying silent on the state of the world. 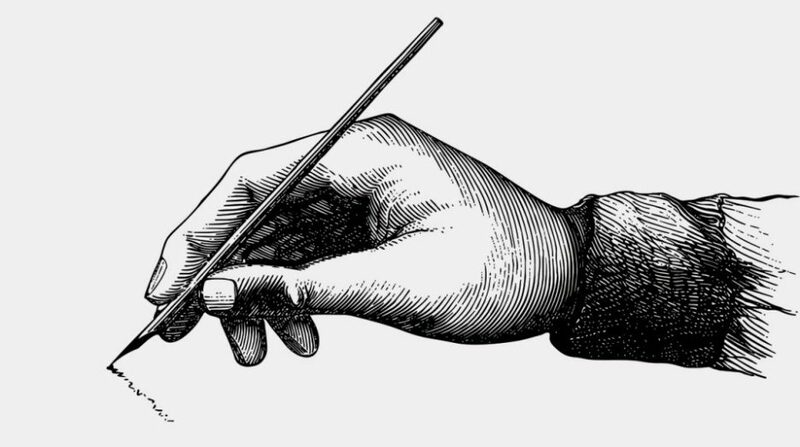 Miriam E. Miles writes about pretty much anything that sparks her curiosity, in particular, society, relationships, mental health, art and creative works, food and life. You’ll only find her in the garden when she’s lost her way and is a wanna-be poet and artist who’s dabbled at the piano now and then. 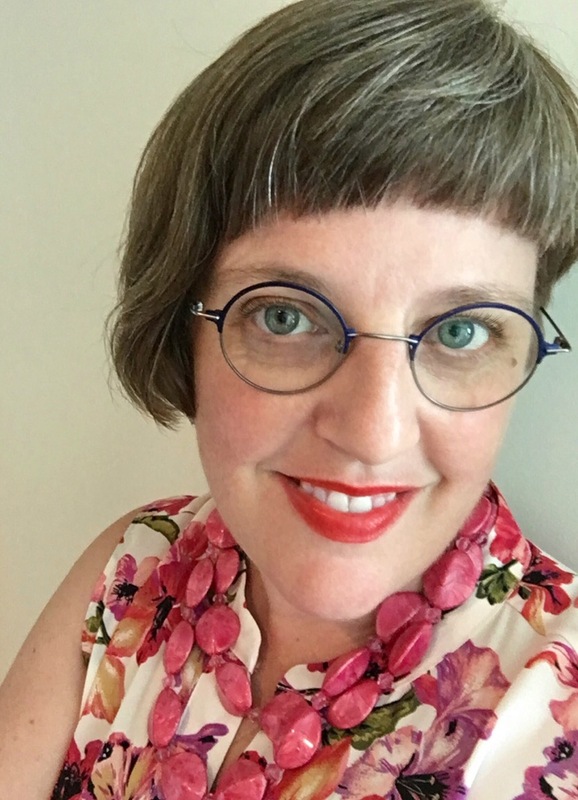 Miriam’s most recent challenge is becoming the founder of Christian Mental Wellness Australia, a not for profit organisation determined to provide the Christian community with valid and Godly resources and strategies to support their mental wellness journey’s.